The 25th wedding Anniversary of Graeme and Michele, "We just want to thank you for smooth running of the music, I can’t remember thanking you on the day, but a great time was had by all, hopefully all got to dance at some time during the evening. It was a total shot in the dark as to the selection of the DJ but we struck lucky when we hired yourself !". The wedding of Jon and Gemma at Hedingham Castle, Essex, "I just wanted to say a big thank you for playing at our wedding the other night, the music was brilliant and just what we hoped for, i don't think i saw the dancefloor empty once !, thank you again and we will certainly recommend you to others !". The wedding of Dapin and Liz at Braxted Park, Essex, "Thanks so much Gavin, you were the perfect DJ !". The wedding of John and Angie at The Sutton Staithe Hotel, Norfolk, "Thank you for your hard work at our wedding on Saturday, myself and John had a wonderful day with perfect music provided by yourself. I have been asked by three people who you are as they were very impressed - i will definitely recommend you. Thanks again Angie and John X". 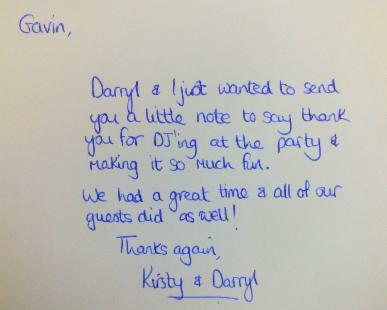 The wedding reception of Darryl and Kirsty at Top meadow Golf Club, North Ockendon, Essex, " Thank you so much for Saturday night we had such a great time, my feet are still hurting from all the dancing !". The wedding ceremony and reception of Chris and Sarah at Hockley Community Centre, Essex, " We were really Happy with Gavin, our day went without a hitch and he played everything we asked for. We would definitely recommend Gavin, and would definitely use him again. We have even had several people comment on the on the music and lighting. Thank you X". The 30th birthday party of Rachael, " from what i can remember ( a little hazy after about 10pm), the whole night was great, you were really friendly and professional and took plenty of requests as well as playing all i had requested prior to the party, the lighting was great and everyone has told me since what a brilliant night they all had, so thank you !". Supplying pa system, playing music and recording funeral service of clients father " Hi Gav, Thank you for all your work over the last few days and making things work so well ". 60th birthday party organised by Charissa,"Thanks so much Gavin, everyone said the music was great !". 30th surprise birthday party of Karen,"Thank you so much Gavin, it was a brilliant night !". From Sue and Graham, "Thanks Gavin, had a great party, you done a great job. Thank you soooooooo much". From Sue Stratton, "No matter what the occasion, charity dance, Xmas party, 18th, 21st or 40th birthdays Dj Gavin gets everyone up dancing and having a good time !". The wedding of Barry and Janice at the Broadway Hotel, Letchworth. "Gavin is a warm and friendly person and very professional. We gave him a list of all the songs we wanted played throughout the day and advised him off the type of music we didn't want to be played. He was extremely receptive to all our requests and everyone had a great time. We couldn't have asked for more". A 13th birthday party at Champions Hall, South Woodham Ferrers, Essex, "I booked Gavin recently for my Daughters 13th birthday party to accommodate 75-100 guests. Gavin was excellent from his initial response to my ad where he talked me through what we would get for the money and put our minds at rest as he was so professional. He arrived on time (early) set up with minimum of fuss and DJ'd the evening excellent and my daughter and her guests were very pleased with his performance during the evening. I would certainly recommend Gavin to anybody looking for a great DJ in Essex". A 50th birthday party in Colchester, Essex. "Hi Gavin, Just wanted to thank you for making my party so very special, everybody said what a great time we all had. The music you played was just exactly what I wanted and I had a great time dancing! Many thanks, Patricia". The wedding of Paul and Anna at The County Hotel, Chelmsford, Essex. "Hello Gavin, We now would like to say a huge thank you! You were more than perfect - very helpful, friendly and professional. I am particularly happy with the email exchange with you - you always kept me well informed and dealt with things quickly and efficiently. You put my mind at ease all the way till the wedding. We were very happy and the guests too. All the best for the future - hope to see you again at another event! Kind regards Mr and Mrs Verity". The wedding of Peter and lynne at The Connaught Club, Chingford. "Thank you Gavin you did a great job at our wedding the guests had fun and you seemed to be able to play the right music for the dancers ! We loved the bubbles and the photo booth was a great hit! ". The wedding of Shane and Lauren at The Blue Anchor, Feering, Essex. "Thanks for making the wedding perfect !". The wedding of Gary and Shantel at The United Services Club, Dovercourt, Essex. "Thank u Gavin for our entertainment for the evening at our wedding reception recently. A very friendly professional guy that met our requests and expectations. Gavin finished our day perfectly and would certainly recommend him to anyone! Will have Gavin again for any forthcoming occasions. Thank u so so much once again !!!!!!!". The wedding of Tom and Claire at St Mary's Art Centre, Colchester, Essex. "Thank you for the great music, you gave a really good party, professional, helpful and very friendly, and extremely good value for money, We all really enjoyed it, I will definitely be recommending you to people, you were brill, and will be my first call next time I need a disco. Thanks for a perfect night!!! :o)". From the 40th wedding anniversary of Pete and Margaret at The Conservative Club, Beccles, Suffolk. "Thank you so much for doing our Disco on our 40th Anniversary you where great you played all what we wanted for all the different age group's in our Party, Thank you again and would highly recommend". The wedding vows renewal celebration of Brian and Pat at Moulton Village Hall, Newmarket, Suffolk. "Thank you Gavin. You Really added something different to the day, friendly and professional, Very helpful, cannot recommend high enough for a super Disco & for the running of the Photo Booth. Thanks for making a great day even better". The wedding of Cameron and Faye at the Dovercourt Park Pavilion, Essex. "We hired Gavin for our Wedding in September! He was great from the beginning. Very helpful, explained everything I needed to know, couldn't have helped more! The night was perfect, we only gave him a brief description of the type of music we wanted throughout the night, but he definitely delivered.